Smith Lake held a very successful 42nd annual Sunriser Lions Ice Fishing Derby that attracted over three hundred anglers. 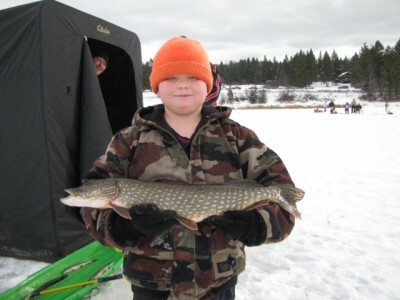 Not only was this successful but this event is probably the oldest ice fishing derby in Montana. Anglers of all ages were pulling out hundreds of pike and perch from 7am to 1pm. The range of sizes were from a few ounces to 5 pounds. The picture above is of Alex Ellis (Plains, MT) as he shows off the 4.85 pound pike that took first in the largest pike category today. There is food and s’mores next to a warm fire for comfort and hunger – who could ask for more on a great day of fishing! Want to make it next year? It is held on the last Saturday of December each year, so mark your 2013 calendar! West of Kalispell, Montana. CLICK HERE to see it on a map.